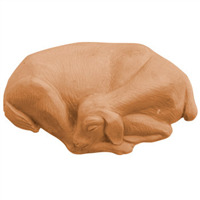 The Goat Milk Bar Soap Mold features a mama goat nursing her kid and the words GOAT MILK underneath. Perfect for your homemade goat milk soap creations. COMMENTS: I use this for my melt and pour soaps. I love the detail and it is easy to unmold the soap. I also paint my soaps with mica powders and the raised goats are just adorable. Love this mold. COMMENTS: Love these for the little bit of soap left over when pouring & just need a single mold. Customers Love these when in gift baskets, etc. Wish they made this mold in the same size but in Silicon. 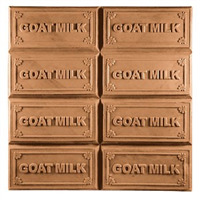 "Great for goat milk soap"
COMMENTS: I love this mold for goat milk soap, it gives you a fun design on what can be very simple looking bar otherwise. It has the crisp details and design that the classic milky way molds are known for. If I could change anything, I would add one more cavity to the mold. COMMENTS: Makes a beautiful soap and colors well with a lot of detail. COMMENTS: People love this mold. COMMENTS: This is a great mold. Very cute and great detail. COMMENTS: Adorable design!! I always put in the freezer for a few minutes and it pops right out. Just wish there were more than 3 cavities to the mold. • Need a bigger mold with more cavities. COMMENTS: Love all of the goats milk molds! 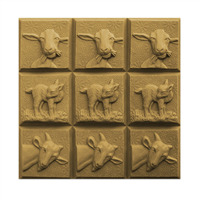 COMMENTS: As I only make M & P Goat Milk soaps, this has become my "signature" mold. This is the cutest goat milk soap mold I've found to date. Everybody just loves the adorable momma & baby! It makes really nice, detailed 4 oz. bars. Soap bars release from mold very easy if you put it in the freezer for just a few minutes. COMMENTS: An adorable little soap - kids love it. 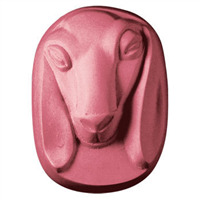 COMMENTS: Love this mold for my goat's milk soap recipe! I saw it at a friends house and just had to have several (bought 5) for my own use. Customers also love that they can easily identify my soap made with Goat's Milk instead of having to read labels. COMMENTS: Comes out clean every time. COMMENTS: Released very easy. I really like this one I have used it over and over. Love it. 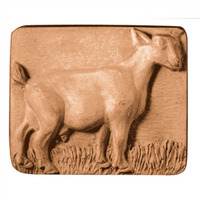 "Goat Milk Bar Soap Mold"
COMMENTS: The attention to detail is beautiful. Soap came out of this mold beautifully. I just received this mold this week and have already sold two bars from this mold. Each bar weighed in at 3.9 ounces. Over all a very nice mold. COMMENTS: We love using this mama goat with a kid mold for our cold process soap.Soap made in this mold has become a top seller just because of the cuteness factor! COMMENTS: I use this with added goats milk in my goats milk m&p soap,scented with goatmilk & honey f.o.I choose not to use vannilla stabilizer in this one as the natural color works with it all just fine.Glad I have this sweet mold. "Love this mold! So cute!" COMMENTS: Customers love this mold, easy to unmold also. 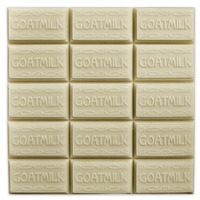 Oh and goat milk soaps are a great seller! COMMENTS: This mold is just too darn CUTE!! I didn't think my customers would like this as much as they do. Good detail, and those who hold it say.....awwwww, how cute! It does unmold easily, and is a great size to fit the hand. "Can you tell me what size soap box these bars of soap would fit in. Thank You." Staff Answer This bar would fit into the soap boxes with the oval window and the solid soap boxes. The others would be too small. "Hi Could you advise me how can I use different colors for using this mold in CP soap making? Thank you. E.K." Staff Answer You could try pouring colored soap into the goat area and then a different color for the overpour. Or, you could paint the soap with mica after it has been unmolded. "Is there anything in this mold that would prevent it from being used for food, mints, candy, etc? " Staff Answer Hi Dale - This mold is made from clear PVC plastic and it is not approved for food contact. "What are the dimensions of this bar?" "What is the mold made out of? hard plastic? " Staff Answer All plastic Milky Way molds are made out of PVC.